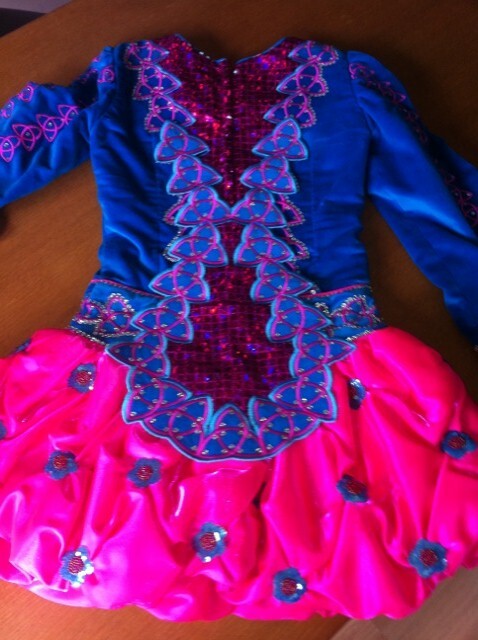 This stunning championship dress in excellant and immaculate condition, has fantastic stage presence and is reluctantly being sold due to my daughter growing far too quickly! This dress has only been worn 7 times and each time my daughter has achieved second place in the open championship. The fantastic dress maker who designed and made this dress is based in London and has many years of experience in designing and making Irish dancing dresses, alongside being the parent of an Irish dancer. The bodice of the dress is made from a beautiful high quality turquoise blue velvet with hot pink detailed embroidery and has a V insert on the front and back, of glitter square material. The embroidery on the sleeves is very detailed along with the belt style waist band. The hot pink (slightly metallic) satin skirt is unusual. It is a quilted puffball style but has been rouched into a gathered effect. This has been complimented by turquoise and pink, sequin and bead flowers, which adds a very modern twist to the style. 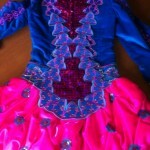 The dress is adorned with over 2,800 Swarovski crystals which provide amazing sparkle on stage. 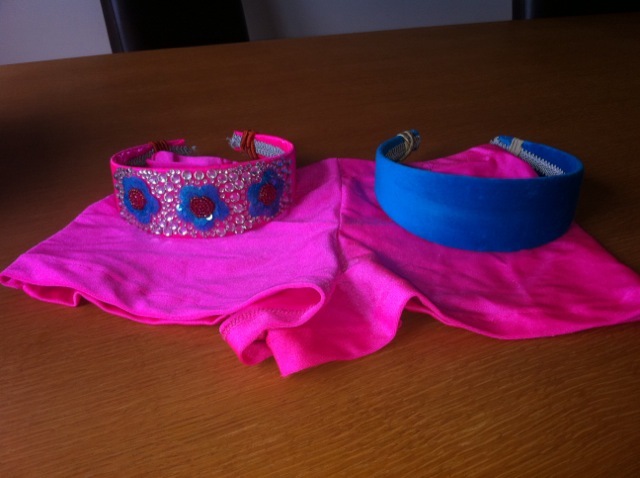 There is a matching headband included with the dress which is made from the same pink as the skirt and has 3 of the sequin flowers on it along with even more crystals there is also a turquoise headband in the same velvet as the bodice. 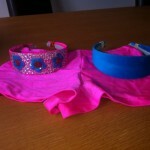 An embroidered and embellished cape and a pair of hot pink boy short style kick pants are also included. This dress is stunning and the pictures really do not do it justice. 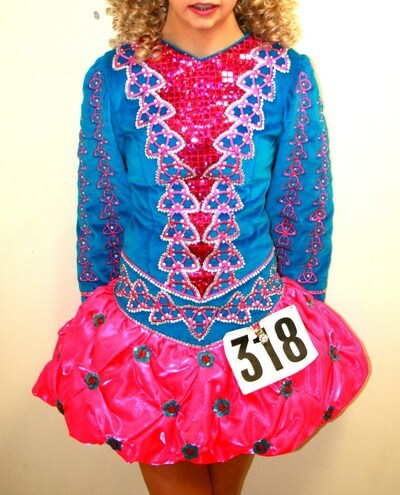 At every feis my daughter is always complimented on the style and colour and she really does stand out on stage in this striking dress. Asking Price: £400. Shipping costs are included for my own country, overseas shipping is extra. Sale is final.